Kids Math Teacher: What Are Your Ten Favorite Math Pins? What Are Your Ten Favorite Math Pins? I find so much inspiration on Pinterest. I enjoy making math activities and Pinterest has been a great place to share and organize my ideas. So,today I'm so excited because I can share some of my favorite pins for Math ideas with you. 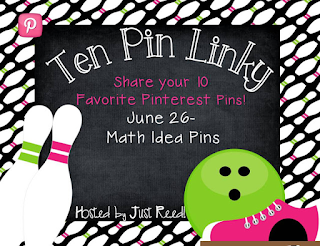 Thanks to Ashley from Just Reed for her Ten Pin Linky , which is just awesome! which is BRILLIANT! Simply Draw a number line with sharpie on a ziploc slider bag and use the slider as the tool to add or subtract two numbers. 2. Second is this fun art project integrated with Math! You could even add percentages too if you wanted. 3. This Easy Counting Workstation is great for young ones! 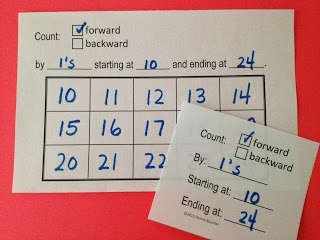 A new way for kids to sort addition or subtraction facts! is just charming and fun to do! 6. Let your kiddos play game using recycled milk caps and dice! A clever way to make kids practice Math! 7. Reinforce math with food with this Edible Place Value Activity! 8. 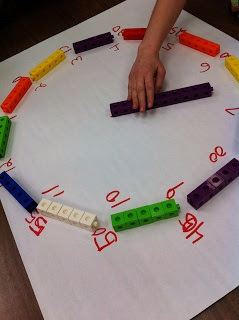 A Hands on activity to understand time! Awesome! 9. Have you used folding towels into a math activity? Brings out the Math warrior in your kiddos! That ends my favorite Pinterest Pins sharing. Hope to share more next time! A lot of great ideas here; the clock with 5 cubes to show minutes in wonderful! We will have to remember that one! Thanks! I think kids often struggle with analog clocks. Thanks for stopping by. Thanks for you comment on Miss Poly! She definitely is the IT Girl! I hope you can come back to my blog and enter my giveaway--there are a lot of great prizes!